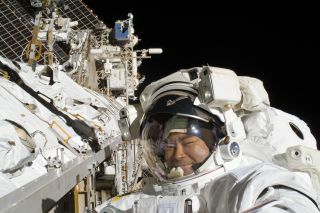 Japanese astronaut Akihiko Hoshide is pictured during a spacewalk on Sept. 5, 2012. During the six-hour, 28-minute spacewalk, Hoshide and NASA astronaut Sunita Williams (out of frame) fixed a critical station power unit and installed a camera on the outpost's robotic arm. This story was updated at 8:40 a.m. EDT. Two astronauts are floating outside the International Space Station today (Nov. 1) in an effort to isolate and repair an ammonia leak in part of the orbiting lab's cooling system. NASA astronaut Sunita Williams and Japanese spaceflyer Akihiko Hoshide officially began the spacewalk — also known as an extra-vehicular activity, or EVA — this morning at 8:29 a.m. EDT (1229 GMT). They're expected to stay outside for about 6 1/2 hours, NASA officials said. You can watch live coverage of the spacewalk here on NASA TV. "Aki, come on in. The water is warm," Williams called to Hoshide as he floated outside the space station's airlock. Each of the orbiting lab's eight huge solar arrays has its own associated power system, and circulating ammonia helps cool this gear down. The spacewalk's first objective is to find the source of the leak, which could affect one of these power channels if it's not addressed soon. This NASA graphic shows the two astronauts who will perform a 6.5-hour spacewalk on Nov. 1, 2012. They are: NASA astronaut Sunita Williams, and Akihiko Hoshide, an astronaut with the Japan Aerospace Exploration Agency (JAXA). On today's EVA, Williams — commander of the station's current Expedition 33 mission — and Hoshide will make their way over to the port side of the station's backbone-like truss. They'll reconfigure some lines in the affected coolant system and install a spare radiator to see if that stops the leak. "We're real suspicious of the radiator," said spacewalk flight director Mike Lammers, of NASA's Johnson Space Center in Houston. "It kind of stretches out there and is susceptible to micrometeorite impacts." Because the leak is so slow, it will likely take several weeks before it's known if the fix works, officials said. If ammonia continues to escape, the station's operators will eventually have to try something else. For example, they may direct astronauts to swap out some of the coolant system's pump gear on another spacewalk. But there likely won't be an urgent need for a new fix, since the spare radiator should provide enough ammonia to keep the coolant system operating until next October or so, officials said. NASA and its space station partners have known about the ammonia leak since 2007, and they've taken measures to deal with it before. Astronauts aboard the space shuttle Endeavour recharged the coolant system with 8 pounds (3.6 kilograms) of ammonia last year. Spacewalks are always challenging, but today's EVA is unlikely to throw anything at Williams and Hoshide that the two astronauts can't handle. In late August and early September, the duo replaced a vital power unit over the course of two spacewalks, defeating an unexpectedly stubborn stuck bolt in the process. "I would say this is an average-skill-level EVA — maybe slightly more challenging than an average EVA," said lead spacewalk officer Allison Bolinger of the Johnson Space Center.